Both Anna and Kendra did this and they are old school bloggers. So I decided to be an old school blogger too and join in. Link up at Miss Elaine's place. Continuity note: I answered some of these Friday afternoon and some Sunday evening. In addition to being an old-school blogger, I am also an extremely lazy and procrastinating blogger. What is the last thing you watched on TV? Vikings. Some of us aren't allowed to watch girly shows like Grey's Anatomy on Thursdays anymore. We have to watch dudes with funny haircuts hack each other up with axes. I do really love when someone yells, "Shield wall!" and they all make, well, a shield wall to protect themselves from an arrow onslaught. I feel as if I should have some similarly useful phrase I could yell to protect me from the onslaught of my children. Like, they would all start harassing me for screen time or ice cream sandwiches and I could be all, "Blanket wall!" and be impervious. When did you last step outside? What were you doing? I left my house at 9:45 this morning to meet my friend for a walk. We try to meet every week to walk around a local nature center. Often I will run there and we'll walk three miles and she'll drive me home. It's a 3-5 mile run there depending on what route I take. Today I took the 3-mile route, but walked for part of it because I was tired. Also, it was really cold out there. What is on the walls of the room you are in? Everything. 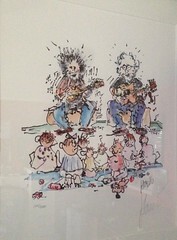 We have several vintage music posters. I have a Bob Dylan Think Different poster—my first ebay purchase ever back in the early aughts. We have a vintage movie poster from The Godfather, a self-portrait of Sam playing his flute, a Harvey Birdman graphic, and original Jerry Garcia art. I also have handprints from all three of my kids that Alex had made for me a few years ago. 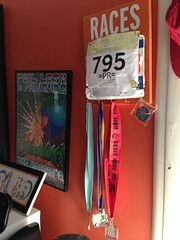 One of my other favorite things on the wall is my race bib holder. This makes me happy every time I look at it. If you became a multi-millionaire overnight, what would you buy? A new house, immediately. Maybe 16 or 17 new cats. Possibly a bread maker—like a person, not a machine. Tell me something about you that most people don’t know. I think you guys know everything by now. Hmmmmm. Okay, here's something: Once a food becomes a "kid food" in my house, I can't eat it anymore. I used to eat peas, but after my kids were little and I fed them a lot of peas, I can't eat them anymore. I love goldfish crackers, but I rarely eat them because they are kid food. My kids eat about a million chocolate chip Fiber One granola bars a week, but I would have to be close to starving to eat one. If my weird little brain decides something is solely a kid food, I won't be eating it again. I don't know why. Who made the last incoming call on your phone? On my cell phone, my mom. On my home phone, three spam calls and then my mom. I try to discourage phone calls from pretty much everyone but my mom, my sister, and Alex, so it seems that my plan is working. If you could change something about your home, without worry about expense or mess, what would you do? Burn it to the ground. Oh, wait, did that question say "without worry about expense, mess, or criminal prosecution"? No? Never mind then. What was the last thing you bought? I am organizing Quinn's school's movie night, which is tonight. I have three giant bags of donated popcorn in my car. This morning I went to the grocery store to buy paper sacks to serve it in. Related, my car smells like popcorn. Would you go bungee jumping or sky diving? Hells yeah. Which store would you choose to max out your credit card? All of them. Is the glass half empty or half full? My glass is currently completely empty and it makes me sad because I'm going to have to walk all the way to the kitchen to fill it up again. What’s the farthest-away place you’ve been? Norway. My mom lived there for several years when I was in college and I visited her a couple times. It's a really beautiful country. What’s under your bed? Probably a cat. What is your favorite time of the day? Not morning, that is for sure. I don't think I have a favorite time of day, but I know that I really enjoy my late nights when everyone else in my house is asleep. They are my calming hours. What Inspires you? Adult autistic advocates. I wish I were as brave as many of them are. I get stressed and tired and overwhelmed and instead of staying in the game, I withdraw to safety. I am in awe of how consistently these men and women put themselves out there even though it can be so hard. I don't always agree with what they say (although often I do), but even when I don't, I admire their tenacity. I'd love to hear your answers to some of these questions in the comments. You be old school too! What is the last thing you watched on TV? Too Cute. Or My Little Pony. I forget. But I had a boy curled up on me, which was far more important. When did you last step outside? What were you doing? This afternoon. I was bringing in groceries and cursing the coming snowstorm. What is on the walls of the room you are in? Pictures of my boys and paintings by my grandmother. If you became a multi-millionaire overnight, what would you buy? A very nice school full of excellent teachers and therapists to work with Joey and Andy. And a truck. Tell me something about you that most people don’t know. I played the baritone horn in high school. And my family is descended from Edward III of England. Yay. Who made the last incoming call on your phone? On my cell phone, a student panicking about having forgotten to take her midterm. On my home phone, CVS telling me my meds were ready. The most frequent caller is my mom. If you could change something about your home, without worry about expense or mess, what would you do? Screen in the porch, expand the kitchen, redo the bathrooms, redo the basement, expand the back deck, and put up one of those awesome cat corridor things around the ceilings of the second floor. I’d also extend my bedroom with a sunroom and a better closet. And then I’d hire a gardener to help me. What was the last thing you bought? Milk. I couldn’t buy bread, there’s a snowstorm coming, and the store was completely out. The last fun thing I bought was flower seeds. Come on, spring! Would you go bungee jumping or sky diving? Not on your life. I hate heights. If you could eat lunch with one famous person, who would it be? Eleanor of Aquitaine. If it has to be someone alive, I’d like lunch with Stimey. If she doesn’t consider herself famous, I’ll take Jess from Diary of a Mom. Which store would you choose to max out your credit card? Chinaberry. Is the glass half empty or half full? I consider myself lucky to have a glass with something in it. So let’s say half full. What’s the farthest-away place you’ve been? India. And it is wonderful. What’s under your bed? My wedding dress. And a lot of old toys, laundry, and other stuff that got jammed under there. And some extra support for my bed frame. And a cat. What is your favorite time of the day? Nap time. What Inspires you? Joey and Andy. Every single day. And as an art historian, I am obligated to say: art. I forgot, redo the kitchen. I need new counters. I LOVE your race bib holder. I know this is only answer but something you may not now about me is when I was a kid, I climbed on top of my swing set and sat on it. > Mullti-millionaire? Buy a small place to eventually retire to, then donate some [not all] of the remainder to charities whose work I believe in. Oh, and a new car to replace my 99 Accord, and an iPad Air. > Home improvement? Finish unpacking. Buy Flor carpet, and some LR furniture. Container plants for balcony. Kitchen herb garden. > Bungee jumping or sky diving? Is this a trick question? Of COURSE I wouldn't. > Lunch? Too many choices. So, right now, I'll offer to buy lunch for Hillary and Bill Clinton, Michelle and Barack Obama, Bill and Melinda Gates, and Pope Francis. > Farthest-away place? Helsinki, Finland. And yes, all of the Scandinavian countries are lovely. > Who Inspires you? Anyone who overcomes obstacles. Also, several family members, both living and, well, not any more. What is the last thing you watched on TV? The first episode of Sherlock season 3, two and a half months ago. I don't know why I even have a TV. When did you last step outside? What were you doing? This afternoon, to get my prescription drugs and to redeem a pawned brooch that belonged to my grandma. Meh. If you became a multi-millionaire overnight, what would you buy? Get rid of my mortgage. Then buy the two adjoining houses. No more neighbours! Tell me something about you that most people don’t know. Most people know far too much about me. I don't know when to keep my mouth shut. Who made the last incoming call on your phone? My youngest brother, nearly a week ago, to tell me that his wife is expecting another baby. Yay! If you could change something about your home, without worry about expense or mess, what would you do? Make my kitchen three times as big. What was the last thing you bought? My grandmother's brooch. See above. Would you go bungee jumping or sky diving? I don't even get why people do such a thing. No. If you could eat lunch with one famous person, who would it be? Terry Pratchett. Which store would you choose to max out your credit card? Any bookstore, anywhere, any time. Is the glass half empty or half full? The glass is always completely full, because air =/= nothing. What’s the farthest-away place you’ve been? Australia. A.k.a. the land where everything is conspiring to kill you. What’s under your bed? Dust bunnies. What is your favorite time of the day? Sunset. What inspires you? The diversity of life in all its forms. And my kids eat that many of those granola bars too! We should own stock. Thanks for linking up! 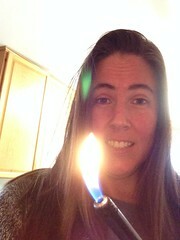 Totally on board with burning one's house to the ground. I set fire to my kitchen once while making fried chicken and we got a whole new kitchen at no cost to us. Because insurance! If we'd waited a little longer before calling the fire dep't, we could have had a whole new house. Next time, I'll wait longer. And I agree...an impervious blanket wall would be perfect. Ooooh, I love nap time too! And I'd like to move into your renovated house with you because it sounds awesome. I think my cats would like to come too. As for lunch, hell, we can make that happen anytime! It's a good one, huh? I'm so glad that your new place has such a nice view. That makes me very happy for you. No neighbors! You are brilliant. That is such a great idea. I think that is actually the best idea of all the ideas. I am lucky that I have good neighbors now, but unknown neighbors stress me out. Also, I'd do pretty well maxing out a credit card at a book store too. It was lots of fun! Thanks for hosting! I'm going to go make me some fried chicken. Awesome! I can't wait to read them! 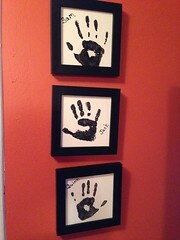 I love the framed hand prints on your wall - they are awesome. I have some that I made of my boys but I have yet to frame them. I really should get on that. Thanks! Yes, much prettier and very much quieter. You can hear the birds. I'm so glad you did this! I just did it at my place! I held on, but I guess I'm a little crazy. At least, I was as a kid. I was hyperactive then.